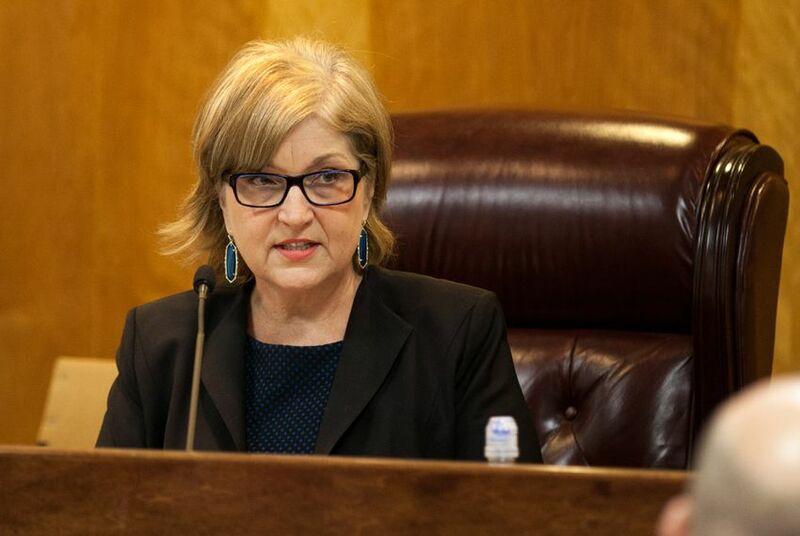 Donna Nelson, who chairs the Texas Public Utility Commission, is trying to crack down on deceptive electricity providers and make it easier for Texans to shop for electricity. Donna Nelson has issued a warning to companies that try to trick Texans into buying electricity plans that are pricier than they appear: The state’s Public Utility Commission is watching. That was a reference to listings on the state-run website called Power to Choose, which is supposed to help Texans shop for retail electric providers on the competitive market. The commission created the portal for comparing rates in 2002 after Texas deregulated the electricity market across most of the state. Consumer advocates have long complained that per-kilowatt-hour price listings for some plans can deceive ratepayers — with fees or other provisions hidden in fine print. Nelson has launched an effort to crack down on the trickery. That yielded changes to the shopping tool late last month: The site now automatically filters out prices with built-in credits for customers who use certain amounts of energy. (In some of those cases, customers can be dinged for using too little electricity.) The move also weeds out some offers — some as low as one cent per kilowatt-hour — that appeared artificially cheap. “The tweaks were really important,” Nelson said. Nelson — first appointed to the commission by Gov. Rick Perry in 2008 and named its chair in 2011 — sat down with The Texas Tribune in her office this week. She discussed what could be next for the Power to Choose website and spoke of trying to strike a balance between too much and too little information for Texans shopping for electricity. TT: What prompted you to bring up the website revamp this year? Nelson: I check the website periodically, just to see what the rates are, and I started seeing those one-cent offers. When I was appointed to the commission in 2008, prices on Power To Choose would just come up randomly. And I was concerned that people would just look at two or three offers, and if they were too high, they would stick with their current plan without looking further. I believe firmly that the only way a competitive market works is if people have access to information, and they can compare offers. So I asked if we could make the lowest offer come up first. Ever since then, there’s been a little bit of game playing. I just want to make sure that customers are seeing something understandable, and it’s not inherently deceptive. TT: It sounds like the website has been evolving ever since Texas deregulated the market. Nelson: We did a revamp of the website a few years ago, and we learn all the time from customer interaction. There are very few retailers out there who want to deceive customers. I think some companies are inventive, and they put a 1.5-cent offer out there. Then the other retailers start losing customers, and there’s a rush to the bottom. So it was time to reevaluate the website. TT: After the latest tweaks to the website — filtering out the credits — what other changes might we see? Nelson: There is a lot discussion on displaying average customer use of electricity. The average Texan uses about 1,000 to 1,200 kilowatts of electricity a month. At one time, there was confusion because website offers showed only prices for 1,000 kilowatts. You had to click further to find rates for other usages. Now, we require up-front postings for 500, 1,000 and 2,000 kilowatt-hours. Still, one question is: How do customers know what their use is without pulling out their bills? Do we somehow connect the Power to Choose website with the Smart Meter Texas website? [That state-run portal allows millions of Texans who have smart meters in their homes to view electricity use. Few have ever logged on.]. We’re trying to strike a balance between providing too much and too little information, while making the website relatively simple to use. TT: How much responsibility lies with the consumer to research the best deal? I know of some ratepayers who switch plans every couple of months. Nelson: Our market is set up so that the power is with the consumer. We have educated consumers in Texas — much more than in other states — because they do have the power to choose. As long as we can make the information accessible, the burden is on them to shop around. TT: What’s the timeline for any further changes to Power to Choose? Nelson: We want to get it done quickly. But I think the change we’ve done right now makes a big difference. The other website — the advanced meter portal — is in transition right now, too. So I think it’s a good time to see if we can link the two together. TT: Each year, the Texas Coalition for Affordable Power [which advocates for cities and other local governments and negotiates their power contracts] analyzes how much Texans are paying for electricity. The latest reports appear to show that Texans in deregulated areas are getting better at finding good deals, but on average, they are still paying more than people served by monopoly providers. Do those studies say anything about how Texas has fared since deregulation? Nelson: I think Texas has fared really well, and I think the rates are really good. On the free market, there’s a difference between what people pay and what they could pay. For instance, you can go to HEB and buy milk, or go to Whole Foods and buy milk. If people are paying more than the available offers, it’s their decision. We're just trying to make sure they have the information to make that decision. I think the vast majority of people would prefer to be in an area where they could choose.